We install HardiePlank exterior siding and corner-boards for chimneys for a complete siding installation, using only high-quality products that will last and last. HardiePlank comes in many different colors and shades and closely resembles the look, texture, and grain of wood siding. However, unlike wood, Hardie board siding is impenetrable to any kind of climate-related damage or injury. The quality is guaranteed. We won’t cut corners. This means we use high-quality cement siding that doesn’t deteriorate quickly. If you want the best durability and the best value, we have it. You will not find a better price for this quality Hardie siding anywhere. 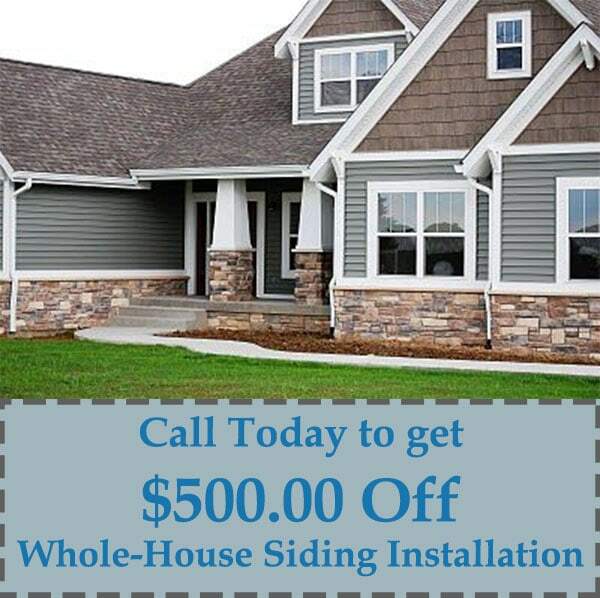 Call now to get $500 off a whole-house siding installation. There are a variety of reasons why your home’s exterior may need an update, and that’s because it serves two primary purposes: curb appeal and structural integrity. Whether you are considering a makeover for your home’s exterior appearance, or you’re seeing signs of deterioration or damage to the paint or siding, Fillo Painting Contractors can help you create a beautiful, long-lasting exterior with our high quality siding selections, professional roofing repairs, experienced gutter replacement, and expert workmanship. Because the exterior components of your home work together to protect it from the elements, it’s important that the integrity of the siding or paint, roof, and gutters are performing together as they should. A failure of one component can cause damage to others. Our craftsmen will inspect your exterior for signs of any potential problems or existing damage. We use only products that allow us to guarantee their quality. HardiePlank is a high-quality cement siding that is available in a wide selection of colors and shades to create the specific look you are seeking for your home’s exterior. It has the same texturing and grain found in traditional wood siding, but is more durable and offers a longer service life. HardiePlank siding is impenetrable to any kind of climate-related damage or injury, withstands damage from moisture and rot, it can fend off the next summer hailstorm also making your siding more fire resistance —and offers a 15-year warranty against peeling, cracking or chipping. Leaks in your roof can cause significant structural damage to your home. Rot damage from even a small leak will eventually affect the beams, siding, and other components important to your home’s structural integrity. Fillo provides professional roofing repairs and installations, and we can perform roofing repairs or replacements at the same time we are replacing your siding, which allows a more seamless appearance. A healthy roof not only protects your property investment, it creates yet another boost to your home’s curb appeal. We are more than happy to provide a combination of services in a complete, well-done package. When you choose Fillo Painting Contractors, you are choosing the best-in-class, premier services for areas of Georgia. Contact us to learn more about our services, and let us get the job done right! Find more information on our roofing & other exterior services here!